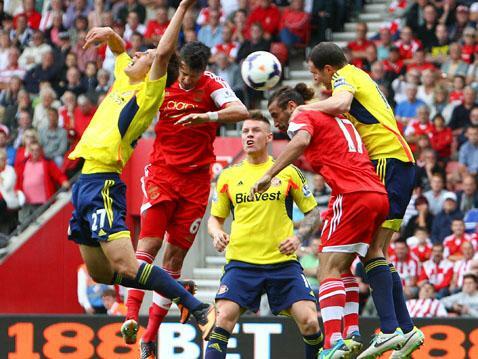 Jose Fonte heads in the late equaliser against Sunderland. Back in the 70s there was an amusing (yes, really!) poem about our relegation season which featured the line A rapid signing – Ossie’s here… but still 4-1 to Stoke. Well, another Ossie’s here now, but no place for Osvaldo in the starting line-up against Sunderland, and still a struggle to score goals. Saints made things doubly hard for themselves when all the big men followed each other to the near post, leaving the diminutive Giaccherini to head home a corner in just the third minute (there were still two defenders in the vicinity, but that only proves that Chambers and Shaw remain works in progress). An early equaliser would have changed the game’s impetus, and most people thought we had one when Rodriguez converted Lambert’s through ball only to be denied by the closest of offside decisions. After that Saints played pretty well against determined opponents but the run of the ball and marginal decisions went against them. It’s not clear whether Sr. Pochettino saw it that way as the team profile changed with injury-enforced substitutions at half time that introduced Osvaldo. I don’t think the new system helped, and neither did the arrival of Ramirez for Lallana, but you still thought that Saints had an equaliser in them somewhere, even if time was running out. Osvaldo showed why defenders might want to kick him very hard in revenge for his ‘challenges,’ but he can also fall over under a slight knock, and that proved crucial. Ward-Prowse’s delivery had been good all afternoon and he provided an enticing free kick for Fonte to finally head past Westwood, who had provided several sharp saves. LSSC Man of the Match: James Ward-Prowse, by common consent.